The Motorola Moto G was so close to perfection - beautiful design, reasonable speed and performance, excellent display, capable camera and the pure Android experience at a bargain price. And we mean the kind of price that makes any quirk or omission easily forgiven. Like limited storage or a poor camera. By throwing in LTE and a card slot, the Moto G 4G makes sure there's a lot less to forgive. If we were to name a smartphone to get an upgrade and handpick the specs, the Moto G would've been on the shortlist. And pretty high there, too. Glad it made sense to Motorola as well. To be fair, the Moto G was fine the way it was. Screen quality well above the pay grade, a good enough chipset, reasonable battery backup, no heavy skin. Bottom line, one of the best packages for the money just got better, with the right touches at the right places. One thing that could've seen some extra work as well is the camera. The original Moto G's still image quality was middling at best, and the lack of 1080p video recording isn't as easy to get away with as it was last year. That said, the Moto G 4G had to stay within budget, there's no argument there. We'll try and see whether 4G network support will take its toll on the battery life. There're a handful of smartphones, including fairly recent releases, that count on a Snapdragon 400 to power both a 720p screen and an LTE radio, so we're not expecting any unpleasant surprises. We guess we can safely cut the introductions short. After all, it's highly unlikely that you may've missed the original Moto G. Either way, we'll be covering its 4G-enabled successor in depth. Our hardware tour begins right after the break. Having seen the retail packages of the Moto G and Moto E, the tiny box with just a microUSB cable inside is hardly a surprise. There're no headphones supplied and you don't even get an A/C adapter. Granted, at this point you probably have a few of those lying around, but if you don't you should add those to the bill. As we said, the new Moto G 4G is absolutely identical to the original model. 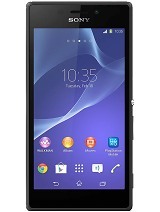 It stands at 129.9 x 65.9 x 11.6mm, which makes it one of the more compact smartphones in its price range. It's not the slimmest package around and you can definitely feel the extra thickness around the waistline but at this size it's not too upsetting. 143g is perhaps too much for the size, though. It certainly contributes to the solid feel in hand, but it's a weight you need to put up with in daily use. The styling of the Moto G 4G is clean and efficient, as if to make a point that it's a device you're going to use, not show off. Even the vanilla Moto X is quite understated - if you decide to skip the customization powers of the Moto Maker. Overall, unlike the Motorola smartphones of old, which tended to be overdesigned, this one bets on simplicity, combining traditional materials and clean (borderline boring) lines. The result is good and even the fact that the Moto G 4G uses two different kinds of plastic for its front and back panels on our white version doesn't spoil the looks. It's clearly not what you'd call an attention-grabber, but that's hardly ever an option when shopping in this price range. Decent build and acceptable looks are what counts in this bracket and the Moto G 4G over-delivers on both. It's certainly well put together and looks like it will have no trouble keeping it up in the long run. There's a protective layer of Corning Gorilla Glass 3 over the screen, while the back can easily be replaced if it gets damaged. Speaking of replacing the back panel - that's only as far as the Moto G 4G will go in terms of customization. It's not nearly as impressive as the Moto Maker for the Motorola Moto X, but it's still an option. A swappable cover doesn't allow easy access to the battery though. Technically, it's a non-removable battery but you can actually replace it yourself in an emergency (though you would need the right tools). As for the handling, despite its less than slender profile and considerable heft, the Motorola Moto G 4G fits nicely in the palm and is not a problem at all to operate single-handedly. The curved back with matte plastic has good grip too. Above the Motorola Moto G 4G's display, the front-facing camera and a bunch of ambient light and proximity sensors are placed each side of an earpiece. With the main controls on the actual screen, the space below the display is completely bare. The same goes for the left side of the Moto G.
The 3.5mm audio jack is centrally placed at the top, where it's joined by the secondary noise-cancelling microphone. The mouthpiece is at the bottom, next to the microUSB port. The port has support for USB host support, so if you get yourself the extra adapter required, you can attach various peripherals like keyboards and mice as well as USB memory sticks. However it has no support for MHL or Slimport, meaning pairing with an HDTV isn't an option (unless the HDTV supports wireless streaming over the Miracast protocol). On the right we see the only two hardware controls on the Moto G 4G. The power key sits slightly above the volume rocker and while both keys are a bit too thin for our liking, they make up for it with nicely solid press. The 5MP camera lens has the loudspeaker on its side at the back of the smartphone, while the LED flash sits underneath it. A Motorola logo completes the tally. Opening the back panel is a bit of a hassle, involving pushing you fingernail in the microUSB slot and pulling with a reasonable amount of force until you undo the stubs one by one. It does feel like the cover is about to break at times, but after several changes it's still in one piece, so the problem was perhaps mostly in our heads. Underneath the cover you get access to the microSIM bed and the hot-swappable microSD card slot. The addition of a memory expansion slot (up to 32GB) is one of the two major upgrades to the original Moto G.
You're not supposed to try and replace the Moto G 4G's battery yourself but you can if it has to be done. All it takes is undoing a few screws to remove the inner cover and you are good to go - if you can live with losing your warranty. But we don't think that's a job easy enough to do on a daily basis. Motorola Moto G 4G runs pure Android 4.4.4 KitKat out of the box. Motorola does not provide any custom additions to the vanilla Android, which is one of the reasons the Moto lineup is treated with Nexus-fast Android updates. The Moto G allows for five homescreen panes. You can't change their arrangement nor can you add or remove panes. Adding stuff on the homescreen is easy, as is customizing it. You can set various live and static wallpapers, add widgets and shortcuts. The app drawer is laid out across multiple side-scrollable panes. The apps are sorted alphabetically followed by the available widgets. Moto G 4G doesn't support custom sorting for the app drawer, nor is there an option to remove the widgets panes, which come right after the app ones. 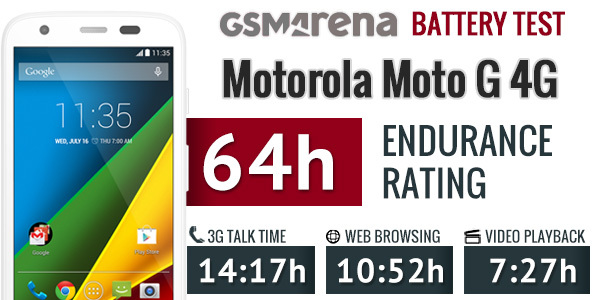 Motorola Moto G 4G is running on an LTE-enabled mid-range Snapdragon 400 chipset. It offers four Cortex-A7 CPU cores, Adreno 305 graphics and 1GB of RAM. We've already seen the chipset in action on lots of smartphone, including the original Moto G, so it's clearly a quite popular choice. And rightfully so as it delivers a snappy performance in everyday use and quite acceptable gaming as well. Starting off with the CPU benchmarks, the Moto G 4G posted a great result on the multi-core GeekBench 3 cross-platform benchmark. The Moto G 4G matched the performance of the Moto G, LG G2 mini and even bettered Xperia M2. AnTuTu is a compound benchmark, which also takes into account RAM and GPU performance. The Moto G 4G numbers are quite good, slightly better than the Moto G, LG G2 mini and HTC One mini 2. Basemark OS II is another all-round benchmark. It gives an overall score along with single, multi-core performance, math performance and more. We focus on the overall score and the dedicated CPU scores. The Motorola Moto G 4G overall rating is OK - on par with the competition. The singe-core and multi-core performance put it very close to the Snapdragon 400-powered HTC One mini 2 an Sony Xperia M2. The graphics benchmark results did come OK. The GFXBench tests - both off-screen and on-screen variants - reflected above average performance. It did better on the off-screen tests but falls behind the lower resolution devices on the on-screen tests such as the Sony Xperia M2, M2 Aqua and LG G2 mini. Moto G 4G and its Snapdragon 400 chipset offers good overall performance. It may not top any charts, but what's really matters is real-life usage and it is great. The Android OS is as smooth as butter with no lag whatsoever, while most of the popular games run just fine. Android 4.4 KitKat offers two gallery apps - the default Gallery and the recently introduced Photos. The Gallery app shows all of the photos on your phone sorted by albums. There is a pop up menu, which allows sorting you images by time, by album or just limit your image access to camera roll. There are lots of sharing options, plus a capable integrated image editor. The Photos app is the latest gallery app Google is trying to push lately. It integrates with Google+ and can backup your images automatically to your Google+ account if you like. It also shows all the photos from your online albums. If you sign in with your Google+ account and allow your photos to be backed up in the Google cloud, you can also use the Auto Awesome feature - it auto enhances your photos and combines similar photos and videos as events in a cool way - it either exports a collage picture or a motion gif. The video player has retained its stock Android interface. Motorola however, have added much better codec support than the one found in Nexus devices. The video player is now perfectly usable out of the box - it plays DivX, Xvid, MP4 and MKV files up to 1080p resolution. The multi-channel AC3 audio tracks are not supported though, which makes the MKV compatibility pretty much obsolete. WMV and MOV files aren't supported either. Streaming videos to a Wi-Fi enabled TV is available. One way to go about this is to share your multimedia content over good ol' DLNA technology OR you can mirror your device's screen to the TV via the Miracast protocol (by casting your screen as it's called in the options menu of the latest Android KitKat). Google's own music player called Play Music handles your music collection. It features the spanking New Listen Now feature, which tries to determine what you like and the sequence of your track-changing so that it can start offering you music you might like to play next. The FM Radio is a pretty straightforward affair. Once you plug in a pair of headphones (to act as an antenna), the app will scan the stations available in your region. You can also input the region manually if the app doesn't configure it correctly. There is RDS support, too. The Motorola Moto G 4G performance in our audio quality test was more or less on par with its non-4G predecessor. The LTE-enabled handset did show slightly higher distortion, but the rest of the readings were pretty evenly matched. 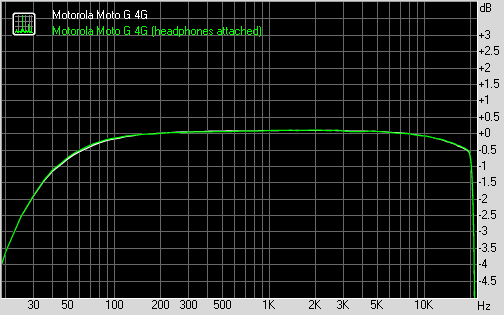 When connected to an active external amplifier the Motorola Moto 4G showed great dynamic range, signal-to-noise ratio and stereo crosstalk. Its frequency response could be better in the lowest and highest frequencies but it was close to perfect for the rest of the range. There were no traces of distortion, either. The good news is, besides the extra stereo crosstalk, there's virtually no degradation when you plug in a pair of headphones. And with the volume levels pretty high in both tests, the Moto G 4G earned an excellent mark here. The Moto G 4G comes with a modest 5MP auto-focus camera. It takes images in a maximum resolution of 2592x1944 pixels. It has a built-in HDR mode, which can even be set to activate automatically in certain shooting conditions. The camera does have the same minimalist interface as on the Moto X and E, which includes just two on screen buttons on the right-hand side for video recording and front-facing camera. Taking an image is done simply by tapping the screen. The available advanced settings include HDR, touch capture, panorama, geo-tagging, widescreen mode, and shutter sound. Unfortunately, the Moto G 4G 5MP camera is no better than the Moto G camera. It produces images with an inspiring amount of detail. Colors are undersaturated and there is very little noise, but that's due to the overly aggressive noise reduction, which eradicates a fair amount of the fine detail - an watercolor painting effect is visible whenever you shoot grass, foliage or similar textures. Turning on HDR does a good job of extending the dynamic range, and somewhat surprisingly it also improves the contrast issues slightly. However colors tend to get a bit overblown in this mode, which takes away some of the realistic look of the images. It's ultimately a matter of personal preference as to which type of image you prefer, but keep in mind that both modes have their drawbacks. Moto G 4G supports shooting 180-degree panoramic pictures. The resolution is quite low though - 2000x500px for the landscape and 1600x600px for the portrait shots. The resolved detail and contrast in those pano images are quite poor though. The Moto G 4G enters our Photo quality comparison tool to face off against other 5MP shooters. You can also pit it against other cameras from within the tools' page. The camcorder UI shares the same viewfinder with the still camera, with the top right button being used to toggle video recording. 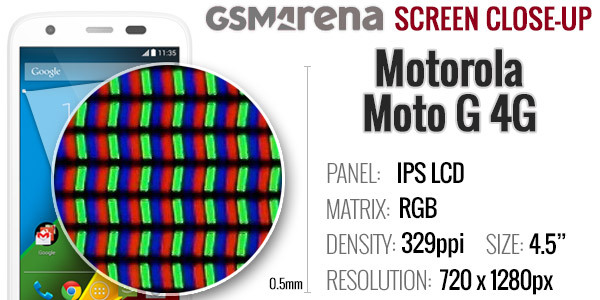 The Moto G 4G records 720p videos at 30fps. The bitrate averages about 10Mbps, which can partly explain the poor resolved detail. Audio is recorded at 128 Kbps in stereo mode with a sampling rate of 48 kHz. Videos by the Moto G 4G are far from stellar, with the low level of detail being the most noticeable issue. There are similar problems with poor dynamic range like on the still camera, and the contrast is still on the low side. Another thing we notice is the significant frame rate drop in low-light scenes - once we reduced the lightning for our video compare test, the Moto G 4G fps dropped down to 22. And this is an untouched 720p video sample taken straight from the Motorola Moto G 4G. The Motorola Moto G 4G is capable of slow-mo 720p videos, but they are quite poor at 15 fps. Here is a sample slow-mo video we've uploaded on YouTube. You can also snap pictures while recoding a video, but they are frame grabs from the actual video and not that good in quality. The Motorola Moto G 4G enters our video quality comparison tool to be pitted against other 720p camcorders. You can choose which devices to compare against from within the tools' page. The Moto G 4G is like an expansion pack, it isn't a brand new device, a successor, a sequel. It is just an improved edition for those who wished for one. It is that simple. It comes with all pros and cons the original Moto G came sans the upgrades. Luckily, the price remains really attractive and the new features will cost you a premium of only about 35. This allows it to keep its place among the cheapest LTE-enable phones on the market. LG G2 mini LTE features a bigger 4.7" IPS display of lower qHD resolution. It runs on the same Snapdragon 400 chipset with 1GB of RAM, but has a 8MP camera with 1080p recording and brings the LG's latest design innovations (the rear control deck), as well the latest Optimus UX optimizations and proprietary features (such as Knock Code). It costs about 20 more than the Moto G 4G and is an option you may consider. And if you don't need the LTE connectivity, the regular model's price is on par with the Moto G 4G's. There is another much cheaper droid, you may want to check out. The 100 Alcatel Idol S packs a 4.7" IPS 720p display, offers LTE connectivity and a microSD slot, comes with an 8MP cam supporting 1080p video capturing, and its shell is very beautiful and just 7mm thin. The phone is less capable though with a dual-core 1.2GHz Cortex-A9 processor, while the PowerVR SGX531u GPU isn't among the snappiest in this class. But hey, the Idol S is almost half as cheap as the Moto G 4G, so you should have that in mind.